Rough terrain forklifts are Class 7 forklifts according to OSHA classifications. Rough terrain forklifts are equipped with durable tires and are designed to handle uneven terrain outdoors, improving the functionality and safety of a work site. There are three main types of class 7 rough terrain forklifts, and all are designed a little differently for varying purposes. The majority of all rough terrain forklifts will have pneumatic tires since they are designed for traveling outdoors, such as on gravel or in yard work. Also, all rough terrain forklifts are fitted with a protective cage to cover and shield the operator from debris and dust. Case Construction – one of the largest manufacturers of rough terrain lifts, Case all-terrain lifts are noteworthy for their max lift capacity and excellent handling. 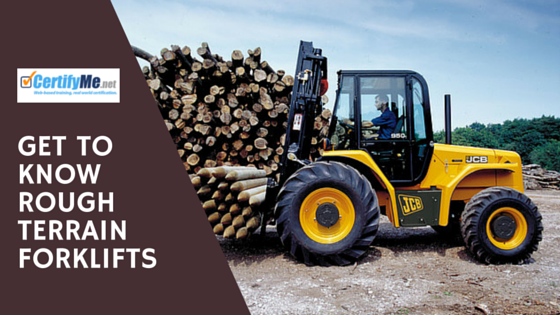 JCB – dependable performance meets exceptional value with JCB’s line of rough terrain forklifts. LiftKing – if you use rough terrain forklifts on the job, there’s a good chance you’ve come across more than a few LiftKing models. CertifyMe.net has exceptional Class 7 rough terrain forklift training for all of your OSHA compliance needs. Because all-terrain forklifts are used in more hazardous conditions than indoor lifts, it’s important that you have the necessary safety training. Get signed up with CertifyMe.net today! In just 5 easy steps, you’re on your way to obtaining rough terrain forklift training and certification! Here are the main differences between these rough terrain forklifts and how they are used in work sites. A vertical mast rough terrain forklift is designed with two large tires at the front of the machine with two smaller tires at the rear. It is ruggedly built to be used primarily outdoors on natural or uneven terrain. Because rough terrain vertical mast forklifts are larger and made to handle heavier loads than vertical mast counterbalanced forklifts (classes 1, 4 and 5), they require more space to operate as well as a sturdy surface that offers substantial support. Operators need to always be wary of soft, muddy ground. All workers need to be trained to operate rough terrain vertical mast forklifts to learn about safe load handling and load weight-to-lift height capabilities. This type of rough terrain forklift is vehicle-mounted and fitted with a telescopic boom lift, which allows this machine to pick up and transport loads at various distances and heights. The boom can reach out directly in front of the forklift, and it can be extended to raise directly above it. Variable reach rough terrain forklifts were originally built for residential and commercial masonry trades. This machine is designed with a low stowed height to allow for superior maneuverability through entryways. Due to the presence of the boom lift, this machine is considered a partially loaded truck even without a load on the attachment. Workers need to be trained in proper load management before operating this forklift. A truck or trailer mounted rough terrain forklift is a portable, self-propelled design that is most often transported to a work site. This forklift is mounted on a carrier which is attached to the back of the truck or trailer and is used to unload heavy loads from the truck or trailer. It can be used on natural, unimproved outdoor terrain and disturbed terrain on a work site, but it is important to note that not all truck or trailer mounted forklifts are considered to be rough terrain. Forklift certification training covers the various types of truck/trailer mounted forklifts and their primary differences. What is a Rough Terrain Forklift Used For? Shipyards/dockyards – some all-terrain forklifts are used in ports and other areas to handle large shipping containers. Rough terrain forklifts have the build and rugged construction to handle tough outdoor work. They have a higher ground clearance, heavier body frame, diesel engines, better ability to navigate hills and slopes, and other outdoor-ready characteristics. This extra capability comes at a higher price. Many rough terrain forklifts are at least twice as much as the average warehouse/indoor/stand-up forklift. If you need to complete your forklift safety training, which includes how to operate all types of rough terrain forklifts, check us out! Our online training program allows operators to complete their training in about one hour, immediately print their certificate after completion, and pay only $59.95 for each section. Along with all-terrain and rough terrain lift training, we also offer certification for regular indoor lifts, pallet jacks, order pickers, and more. If you have any questions about our forklift training courses, call our office today at 1-888-699-4800. This post was originally published in 2016 and updated in 2018 to include an infographic guide.